A reverse head and shoulders pattern is slowly emerging, although the second ascent is showing a slight degree of lagging, and incomplete chop. Ideally, we would need this trading range to hold, in order to shoot up at least a day ahead of the actual fork deadline. Any severe moves below the first $2,654.86 foothold, that end up successively and hastily breaching additional supports, all the way down to the $2,400 weekly low, can be taken as a red flag. Trading began yesterday (GMT 00:00), at a price close to the present market level of $2,673, before rocketing up to the $2,882 new weekly high. The existing price gap appears to be stable for the time being. Weekend trading might bring about more clarity as to how, and in what way everything will play out. Influential market participants, should have a good show lined up for the actual day of the fork, as well as for subsequent days after the main event. Expect a wrap up once everything of interest finishes locking in (all variants, bitcoin iterations and protocols), although a last hurrah afterwards cannot be completely ruled out, however unlikely it may seem at this point. Hourly volume remains constant, a bit above the last pre-dip average, but not by a lot. 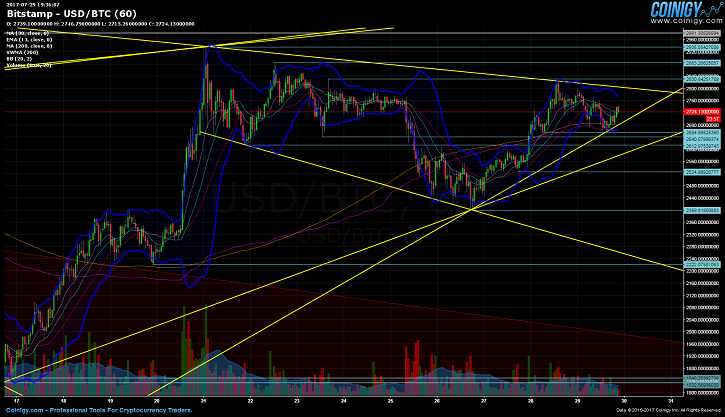 If this really is the right shoulder, then we are going to need more volume before the final run-up. The first support is at $2,654.86, the rest from this markup phase are at $2,640.57, $2,612.97, $2,524.98, and lastly at the $2,400 weekly low. Respectively, the first two resistance levels are at $2,824.06 and $2,830.84, the next being at the $2,882 weekly high, onward from there at the $2,938 monthly high, and lastly at the $2,980 all-time high. FIB levels from the prior trading range are not suggesting any interesting points, aside from the 0.5 fib being in adjacent proximity to the current $2,400 weekly low. 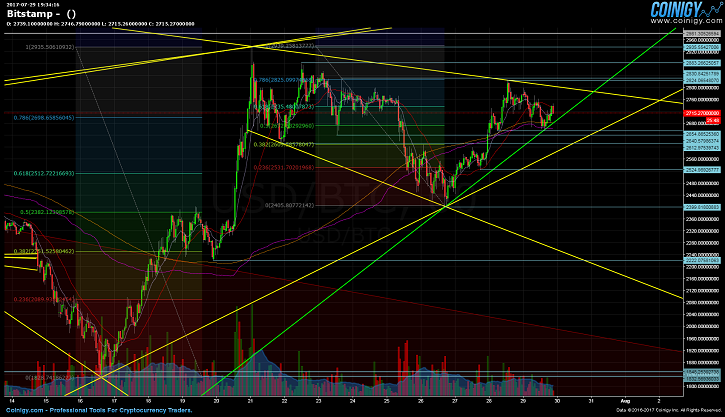 On the other hand, Fibonacci extensions tied to the ongoing trading spread, demonstrate a more pronounced overlap. 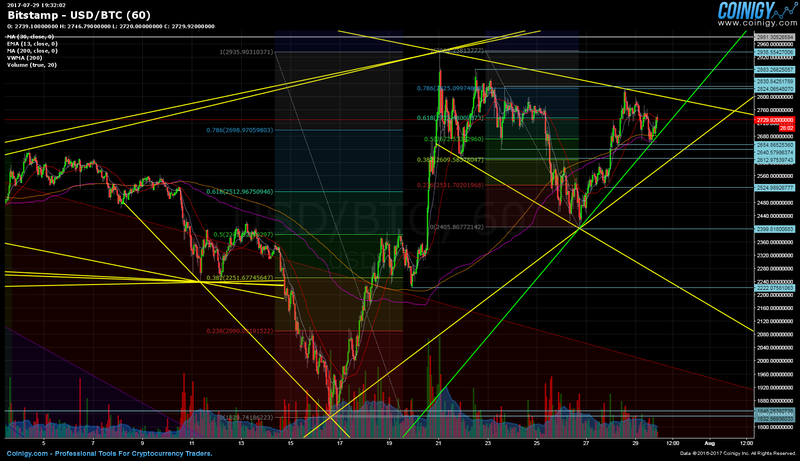 The 0.382 fib is close to the $2,612.97 support, while the 0.236 fib is neighboring the 2,524.98 support. Only the first two resistance levels, at $2,824.06 and $2,830.84, are near a fib level, with the 0.618 fib is standing at $2,735.48. A bullish MA crossover has occurred, the 30-day MA has risen above the 200-day MA, which is horizontally drawing itself out, albeit below the price line, despite a marginally faltering right shoulder trading dynamic. Intersecting trend lines all gravitate towards the weekly low, as a point of possible future struggle, a break below the approaching greenish trend line, should be broadly treated as a bearish short term signal. As it stands, the Bollinger bands remain relatively constant and stable for now. The gap between the upper/lower bands is not fluctuating dramatically, although if circumstances allow for it, we may see a widening of this inherent stretch, and consequently more volatility. 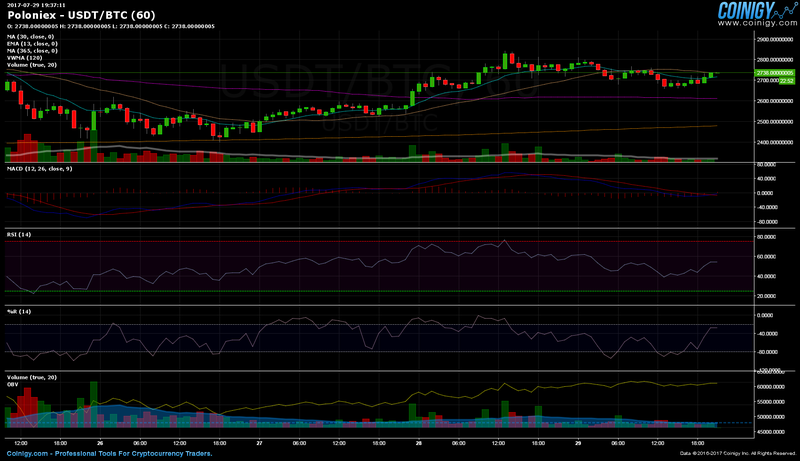 RSI is stagnant; the indicator does not look oversold or overbought at present. It is largely indifferent to the short-term existing price trend as well as overall market movement. The Williams %R indicator appears oversold, while the MACD is waning, which is in divergence and contrary to momentary price movement. OBV has kept to a steady rise, even though trading volume has flattened out during the same period. Bitcoin began trading on July 28 (GMT 00:00) at $2,665.71, a value that was revisited during brief selling spurts, twice today alone. However, trading never broke past yesterday’s $2,824.06 daily high, which is additionally, the first resistance that needs to be shattered, before a higher move up can be confirmed. Volatility in the last 48 hours has been adhering to a range between $2,654.86, and 2,824.06. If you have any questions or opinions concerning bitcoin, please feel free to use the form below to reply and/or comment.